$945 in seats ADDED to tournaments ALL WEEKEND LONG VIA THE CHARITY BECOMES THE BACKER PROMOTION! Saturday at 12p & 230p are $50 TV SNG's as well. Also at 12p on Saturday is a $110 Deep Stack with 35k Chips. NEW 2019 SPRING FORMAT & ENTRY. (2) MAY 24th Championship Seats ADDED to the pot! Then finally at 630p Saturday is a $70 Bounty Deep Stack with FREE PIZZA! (3) MAY 24th Championship Seats ADDED to the pot! $1/$2 action starts at noon with $50 min and $500 max entry on Saturday. Sunday features our $50 TV table at noon & 530p. Also @ noon is $1/$2 cash game action! 12p also features a $50+$10 Tournament for those of you who want to jump into the Uber Stack - Bonus chips for 3 cans of food donated! (2) MAY 24th Championship Seats ADDED to the pot! FREE PIZZA FOR AFTERNOON PLAYERS! 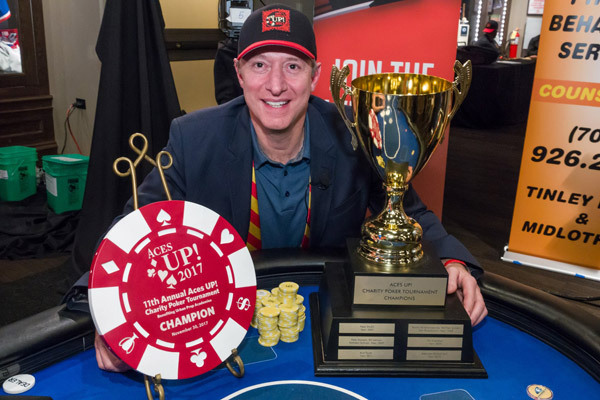 On Thursday, October 25, 2018 Urban Prep Academies will be hosting its 12th Annual Aces Up Charity Poker Tournament, making it one of the longest running charitable poker events in Chicago. Hundreds of players will hit the felt, trying to best one another in this game of skill and chance, all vying for a piece of the prize purse valued at more than $10,000. 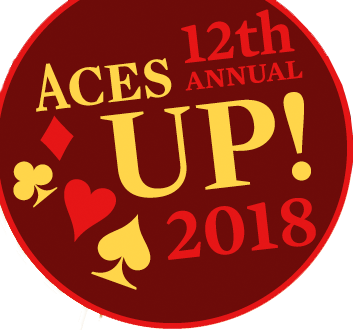 You can register for this the 12th Annual Aces Up Charity Poker Tournament here. Tickets for spectators can be found there as well. Aces UP! 2017, Urban Prep’s 11th Annual Charity Poker Tournament, was held on Thursday, November 30th at The Chicago Sports Museum. With hundreds of players and spectators filling the place, and enjoying a world class buffet and open-bar, excitement and competition were at an all-time high. Hosts Alexi Giannoulias, Richard Roeper, Chris Zorich and Urban Prep founder & CEO Tim King were back at it, adding extra energy to the night’s fun. Per usual, participating celebrities were marked men and women as bounty prizes were awarded to players for knocking them out of the tournament. These “Celebrity Bounties” fought as hard as they could, but ultimately surrendered their poker chips – and medals – to deserving competitors. For the guests who weren’t trying their hands at poker, two new game tables were added to the mix: Blackjack and Roulette. Participants in these table games were allowed to cash their chips in for entrance into the Aces UP! 2017 raffle. The prizes included Chicago Bulls game tickets, certificates to Lettuce Entertain You restaurants, a $500 gift card and limited edition Nike basketball shoes designed specifically for Urban Prep. There was additional pressure for the eight players who made it to the tournament’s final table, which was broadcast live online by Windy City Poker (and aired on Comcast SportsNet in 2018). They battled tirelessly for a piece of the prize pool valued at over $10,000. When the dust settled, Aces UP! 2017 champion Matt Perno was the last standing, claiming the coveted “ChampionCHIP” and earning a place on the golden Aces UP! Championship Trophy. This Saturday Night - Fifth Annual "ALL IN FOR A CURE" Poker & Casino Night! 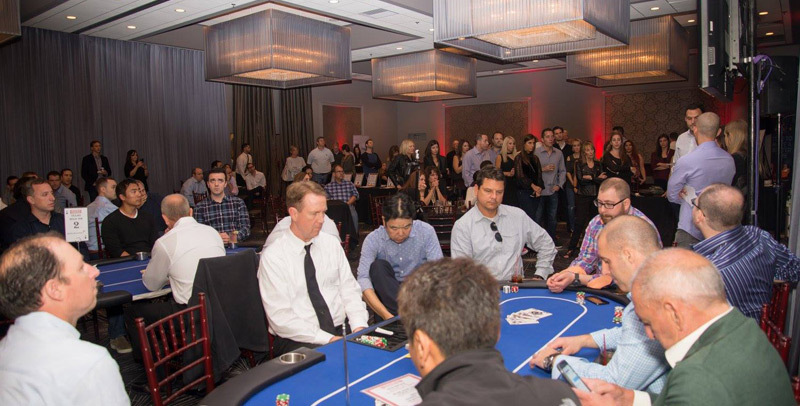 You are cordially invited to the Fifth annual "ALL IN FOR A CURE" Poker & Casino Night! Chicago Poker Club and Windy City Poker are giving away seats. Share this article on Facebook or Twitter with hashtag #CPC4aCure to enter! This special night will feature dinner, premium open bar, silent auction, charitable poker tournament and charitable casino games. The grand prize winner of the poker tournament will win a $10,000 Main Event Seat to the World Series of Poker in Las Vegas! This incredible event benefits the Chicago Diabetes Project in partnership with Special Kids Network. For more information, including registration click here. For tournament structure, click here.